Jaap van de Guchte Senior stands on the port side half way up the ship's 110- m length. With hand signals, two fingers pointing aft. he directs the helmsman to move the precise two meters for alignment of the tanker's cargo manifolds and those on the BP refinery dock. This will be the first cargo for the new motor tank ship Rosette. It is owned by Jaap Sr. and his two sons. In the elevated wheel house aft one of those sons and the captain for this trip, Jaap Jr., watches as one of his crew stands at the futuristically styled control console, working the jog stick controls of the powerful diesel electric bow thruster he moves the ship aft until Jaap Sr's crossed arms signals, "All stop". The boat's 2,000 hp Cummins QSK60 main engine has been showing 650 rpm idle on the digital read out. The mate touches the throttle and the digital monitor moves up to 1,150 rpm. The ship stop's almost instantly as her big 1.7-m propeller bites into the waters of Amsterdam's America Haven oil terminal. Like her sister-ships, being finished at the Verka Shipyard near Dordrecht Holland, the Rosette's hull, with its 11.45-m beam, was built in two parts at the Centromost Shipyard in Poland. After launching, the fore and aft sections were joined to form a hull with 10 holds having a total volume of 3,785 cu. m.
capable of holding about 2,900 tons of cargo. The hull, known as a Maxcube type, was then towed to the Verka Shipyards in Holland for completion. The third in a six-vessel series, the Rosetta is double hulled with the resulting space divided in to 10 ballast tanks. The void between the two hulls is 80 cm. When this amount is deducted from the 5.8 m molded depth, the cargo tanks are five meters deep. On the de Guchte's previous single hulled boat, the tanks were four meters deep and could be pumped with deck level pumps. On the Rosette, the greater depth requires submersible pumps that push the oil up. The interiors of the 10 cargo holds are coated for the transport of light chemicals and each is equipped with a Marflex deep-well pump. With each of the 10 pumps capable of moving 100 cu. m./hr. meters per hour and each tank holding 380 cu. m., they expect to be able to discharge a full cargo in under four hours. 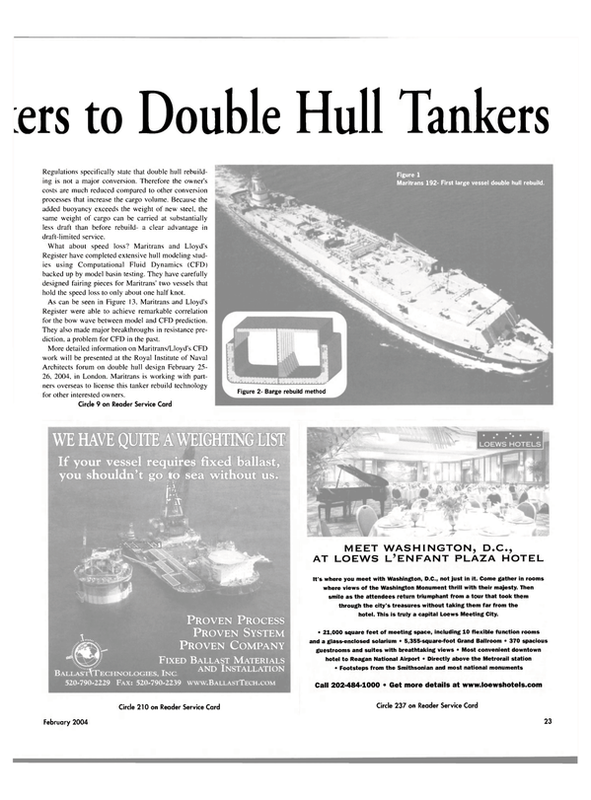 Jaap estimates that of about 700 tank vessels registered in the Netherlands, about 25 percent are now double hulled. On her regular scheduled rotation, two fourperson crews will work the vessel in 14 day turns. She will operate from the harbors of Rotterdam, Antwerp, Amsterdam and on the Rhine River east to Germany, France and Switzerland. Her home port is Hansweert, Netherlands. The Rosette's Cummins KTA19 powered 463 kW main genset can handle all 10 cargo pumps simultaneously if the shore facility can handle the volume. The ship's secondary generator, also located in the forepeak, is a Cummins 6CT8.3 liter-powered 163 kW set that can. if required, drive up to three of the pumps at a time. This genset also serves functions such as the heated air compressor designed to avoid condensation in the lines when used for degassing the tanks or for the masks worn by the crew when inspecting the tanks. A third Cummins 6BT5.9-liter-powered emergency or hotel services 78 kW generator is located in the main engine room aft. With most of the electrical needs for the vessel met by the forepeak generators, the main engine room is spacious and bright with ample space for the 2,000 hp Cummins QSK60 main engine sitting well aft. The main engine is coupled, through a Centra flexible coupling, to a ZF W16500 marine gear with a 5.5:1 ratio. The gearbox is equipped with 1:1 PTO shaft, driving a steering pump. The aluminum covered and insulated exhaust stack exits aft through the transom. The bright finished aluminum diamond checked plating follows the hull contours as they taper aft around the gear and short main shaft. The result is a brilliant setting for the engine that is enhanced by the metallic gray covers on the off white of the engine itself. Not only is this an effi- cient engine space, it is a testament to the de Guchte's pride of ownership. Jaap van de Guchte Jr. is particularly pleased with the Cummins Centinal and Eliminator options. The Cummins Centinel Advanced Engine Oil Management System, virtually eliminates oil changes. Simple in concept, the system uses advanced software to remove a small amount of used oil from the lubrication system and send it to the fuel pump. The used oil blends with the diesel fuel and is burned with the fuel during combustion. Not only does it eliminate the need for oil disposal, it also converts used oil into productive energy. As the Centinel System blends used engine oil into the fuel stream, it simultaneously adds new oil from the vessel's bulk makeup tank into the engine. The Eliminator Filter system effectively does away with replaceable components in the lube oil system. Taking the place of several conventional filters, the Eliminator Filter unites two proven technologies — a self-cleaning full-flow filter that removes 85-90 percent of particulates over 20 microns and a disc stack centrifugal separator that removes particles down to two microns 01 less. The result is a better- protected engine and significantly reducec risk of someone inadvertently dropping a bucket of used oil filters overboard when transferring them to the dock. The Rosette like most European river vessels, use box coolers for both the auxiliaries and the main engine. Unlike the conventional external hull-mounted keel coolers, these box coolers involve a series of U-shaped tubes in a manifold set into a box inside the hull through which cooling river water circulates. On the Rosette installation. Cummins specified the use of a specialized blue fluid for the cooling known as Fleetguard ES Compleat Extended Life Antifreeze Coolant. On her sea trials, the Rosette impressed with her low noise levels. In the wheelhouse, which raises itself 1.6-meters on a hydraulic pedestal, engine noise was so limited that the operators were dependent on the tachometer as they couldn't hear the engine revs. The main deck house, which is directly over the engine room has reduced noise levels due to the soft mounting of the whole deck house that stops the transmission of sound through steel. But even in the engine room the decibel levels were well within the regulatory requirements. Sea trials also demonstrated remarkable stopping power of the ship. "I like this engine very much," says Jaap Jr., "Our crash stop was very impressive. The electronic controls allow us to take the throttle from full ahead to full astern in only ten seconds. And the ship comes to a full stop in only 350 meters or 110 seconds." The boat achieved an average speed of 18.7 km per hour on sea trials with the main engine and an 85 percent cargo load giving her a 3-metre draft. With the bow thruster alone, it was able to move at 6.5 km per hour. Dutch canal and river barges tend to be owner operated. This is reflected in the extra quality touches in the living accommodations. On the Rosette, the living quarters are all in the stern house which is large enough for five bedrooms, four singles and a double, as well as two shower rooms and two heads. A huge galley, mess and living room lounge area extends down the starboard stern quarter. In his large cabin. Jaap Jr. has set up his computer complete with scanner and other peripherals that allow him to keep track of the vessel's book keeping as well as to produce his extensive collection of boat photos. After taking on her first cargo at the BP refinery in Amsterdam, the MTS Rosette began the journey south to Antwerp. With 2900 tons of diesel aboard, she was drawing 3.5 meters of water and making a remarkable 21 km per hour. Jaap van de Guchte both Senior and Junior are justifiably pleased.